Set of two mugs comes with four forks and eight tea light votive candles. Fondue for two! Make any day a special occasion with Evelots personal fondue mugs. Perfect for a romantic evening, anniversaries, birthdays, or any day you want to enjoy a simple, elegant cheese or dessert fondue. Individual servings are perfect for sharing and sampling without having to make a giant pot. Easily melt chocolate and cheeses for dipping fruit, veggies, bread, crackers, marshmallows, lady fingers, and more. At the end of a great meal, ceramic mugs are dishwasher safe for effortless cleanup. Also microwave safe for faster melting of fondue (remove tea lights before placing in microwave). Wooden cutting board not included. When the included candles are used, simply replace with any standard tea light. Each mug measures approximately 4.75"H x 3.5" in diameter. Each Fork is stainless steal with plastic handle that measures 5.5"L. MINOR DEFECTS INCLUDE: bubbling of the paint during manufacturing and tiny pits that were formed during the drying process. 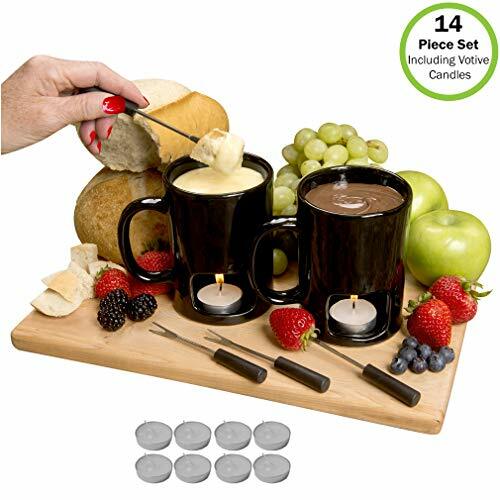 Set of two mugs comes with four forks and eight tea light votive candles.Make any day a special occasion with Evelots personal fondue mugs. Perfect for a romantic evening, anniversaries, birthdays, or any day you want to enjoy cheese or dessert fondue for two. Easily melt chocolate and cheeses for dipping fruit, veggies, bread, crackers, marshmallows, lady fingers, and more. Individual servings are perfect for sharing and sampling without having to make a giant pot. When the included candles are used, simply replace with any standard tea light. MINOR DEFECTS INCLUDE: bubbling of the paint during manufacturing and tiny pits that were formed during the drying process. Ceramic mugs are dishwasher and microwave safe. Each mug measures approximately 4.75"H x 3.5" in diameter. Holds approximately 6 oz. of liquids.